We’re hastily approaching the “Month of Love” here in the ultra-romantic, snow-covered Adirondack Mountains. Every winter, couples escape their overcrowded cities, hectic schedules, and stressful jobs for an extended weekend of relaxation, romance, and a bit of adventure here at Garnet Hill Lodge in tranquil North River, NY. Most couples cannot get away on Valentine’s Day (February 14), thus creating an entire Month of Love here in the Adirondacks. 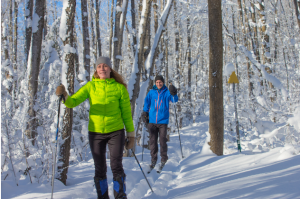 February is one of our busiest months because Valentine’s getaways coincide with the peak Adirondacks cross-country skiing season here at Garnet Hill, the perfect alternative to overpriced Upstate New York resorts. 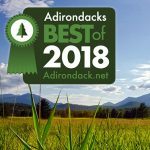 Garnet Hill Lodge is conveniently located near all the best things to do in the Adirondacks, regardless of the season. When you stay with us, you’ll have prime access to the Garnet Hill Outdoor Center and 55 kilometers of daily-groomed cross-country skiing trails. The Outdoor Center also offers 15 kilometers of snowshoeing, fat bike rentals, and access to a wealth of backcountry ski trails. Our peaceful Adirondacks wilderness will be chock-full of fantastic events during the Month of Love, including a Moonlight Snowshoe Tour, the annual Garnet Hill Winter Fest, and Winter Weekend Tours. Don’t fret if you cannot visit us in February, because several winter wonderland events are happening throughout the season. Garnet Hill Lodge, unlike most Upstate New York resorts, has a cozy, log cabin-style Adirondack restaurant. 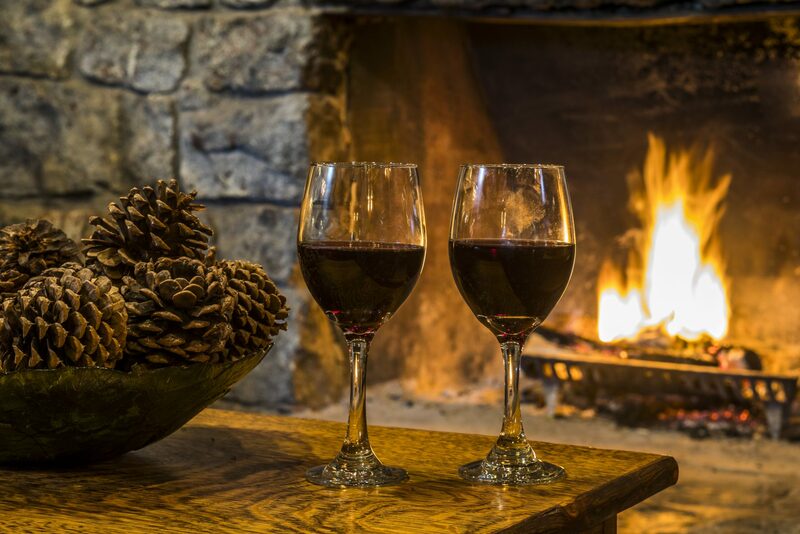 There’s nothing better than a delicious home-cooked meal near a crackling fireplace inside the romantic on-site Log House Restaurant & Pub. Our talented culinary team has created an inventive yet classic dinner menu that pairs perfectly with award-winning wine and sweeping Thirteenth Lake views. Choose between slow-cooked Icelandic spring lamb, 28-day aged ribeye steak, and roasted farm-raised rainbow trout. Then cap off your memorable fine dining experience with one of MJ’s famous homemade pies. After each full day of Adirondack adventures and delicious local cuisine, retreat to your comfortable, romantic Log House lodging for an evening of relaxation and romance. In addition, both of our campus cottages, Tea House and The Birches, are perfectly nestled in the woods, creating a secluded, cabin-like experience that all other Upstate New York resorts simply cannot provide. Several of the rooms in these cottages feature sizable two-person Jacuzzi tubs, and all have flatscreen televisions, and Adirondack wood accents. Sweethearts can also take advantage of our Valentine’s Day Lodging Package on February 14-16. The package includes a single rose, chocolate-covered strawberries, and champagne for two! We will also have a special Valentine’s Day menu at the Log House Restaurant. Please give us a call today at 1-518-251-2444 to book a well-deserved romantic getaway to serene North River, NY.